The naturally zingy, peppery, water-dense radish gives the perfect bite to our cold-pressed Fiesta. Although it’s not a veggie you’d normally think of eating, it’s one you should start considering! These root veggies are filled with some of the best skin-healing nutrients including vitamin C, zinc, and B-complex vitamins. They not only help radiate the skin, but also help hydrate and disinfect, which ultimately rejuvenates dry skin, heals rashes, and prevents wrinkles. But that’s not all…radishes also have the unique property of removing bilirubin buildup, which consequently helps reduce jaundice. Not to mention, it’s also a natural decongestant, excess-body-heat reducer, and strong kidney cleanser. So, why not ratify the radish? They are totally and absolutely… rad! Try our cold-pressed Fiesta and reap these benefits! Fiber, vitamin C, folate, potassium, riboflavin, vitamin B6, calcium, magnesium, copper, manganese, selenium, phosphorus, zinc, some omega-3 and omega-6, and glucosinolates. Radishes are natural, body coolers that can lower excess body heat, which is surprising since the radish flavor is usually associated with a peppery, spicy bite. Vitamin C, copper, iron, vitamin B6, niacin, riboflavin, calcium, potassium, manganese, phosphorus, vitamin B12, essential fatty acids, fiber, essential amino acids, and glucosinolates. Maca used to be prescribed to Inca warriors to build their strength and endurance for battles. Maca powder has also been used to enhance fertility in both humans and animals. Lacinato kale may be less bitter than its curly kale brother, but it still comes equipped with all the same benefits. Containing rich levels of vitamins A, C, and K, as well as 45 different flavonoids and tons of plant-based protein, kale is a true nutrient powerhouse! These rich leafy greens are so nutrient-dense that we like to think of them as our all-encompassing healthy greens. Why, you may ask? Well … kale supplies so many health benefits it’s hard to keep up: extraordinary anti-inflammatory and cancer fighting properties, immune support, blood sugar regulation, strong detoxifying and blood purifying properties, and so much more. Kale is also rich in fiber, which effectively binds bile acids and helps lower bad blood cholesterol as well as reduces the risk of heart disease. It’s hard to believe there is even more, but above and beyond all of the vitamins and minerals found in kale, large amounts of the unique detoxifying phytonutrient, glucosinolate, can be found. Glucosinolates break down into isothiocyanates, which can activate our detoxifying enzymes that effectively conjugate and eliminate toxins from our bodies. So what more can we say, kale is essential to cleansing, but there is one downfall … Warning: People with untreated kidney or gallbladder problems should avoid kale due to its rich oxalate content. If oxalates become too concentrated in our blood, they can crystallize and cause health problems, more specifically, kidney stones. Tip: you may be able to counteract this with cold-pressed orange juice. Vitamin K, vitamin C, omega-3 fatty acids, fiber, copper, tryptophan, calcium, B-complex vitamins, folate, phosphorus, vitamin E, iron, magnesium, potassium, carotenoids, protein, glucosinolate, and a variety of phytonutrient antioxidants including at least 45 different flavonoids. Kale, per calorie, contains more iron than beef. Keep your friends close but your kale closer. 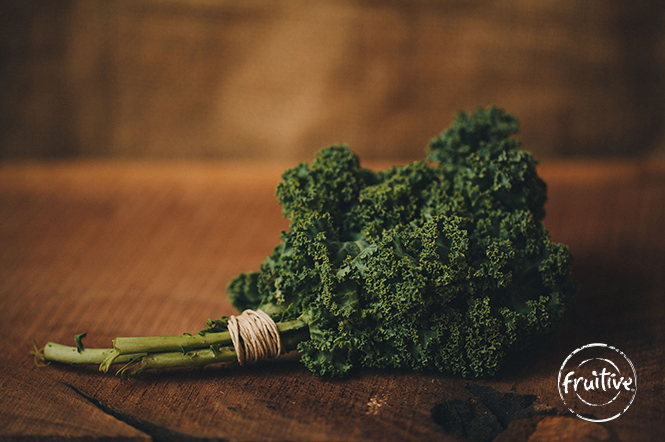 Containing rich levels of vitamins A, C, and K, as well as 45 different flavonoids and tons of plant-based protein, kale is a true nutrient powerhouse! These rich leafy greens are so nutrient-dense that we like to think of them as our all-encompassing healthy greens. Why, you may ask? Well … kale supplies so many health benefits it’s hard to keep up: extraordinary anti-inflammatory and cancer fighting properties, immune support, blood sugar regulation, strong detoxifying and blood purifying properties, and so much more. Kale is also rich in fiber, which effectively binds bile acids and helps lower bad blood cholesterol as well as reduces the risk of heart disease. It’s hard to believe there is even more, but above and beyond all of the vitamins and minerals found in kale, large amounts of the unique detoxifying phytonutrient, glucosinolate, can be found. Glucosinolates break down into isothiocyanates, which can activate our detoxifying enzymes that effectively conjugate and eliminate toxins from our bodies. So what more can we say, kale is essential to cleansing, but there is one downfall … Warning: People with untreated kidney or gallbladder problems should avoid kale due to its rich oxalate content. If oxalates become too concentrated in our blood, they can crystallize and cause health problems, more specifically, kidney stones. Tip: you may be able to counteract this with cold-pressed orange juice. Hey y’all! Collards, famous for their use in traditional southern cuisine, are packed full of nutrients, including a large variety of vitamins, minerals, and phytonutrient antioxidants. However, a few nutrients stand out among the pack as collards are a very rich source of vitamin K and A, providing us with superior bone and blood benefits, inflammatory regulation, and eye health. Collards, like most other cruciferous vegetables and leafy greens, are also surprisingly good sources of plant-based protein, and are strong cholesterol-lowering agents and detoxifiers. One specific detoxifying antioxidant, glucosinolate (pronounced “glu-co-sin-o-late”), breaks down into isothiocyanates (pronounced “iso-thio-cy-a-nates”), which activate our detoxifying enzymes that help conjugate and eliminate toxins from our bodies, thus, making collard greens (and other leafy greens) a go-to detoxifier. Not to mention, collard greens also make great gluten-free wraps – try our Collards Wrap and experience the deliciousness! detox properties, helps conjugate and eliminate toxins, anti-inflammatory, anti-cancer, lower risk of cardiovascular disease, digestive support, anti-aging skin properties, immune boosting, eye health, may help relieve and prevent inflammatory-related conditions and diseases, helps keep calcium in bones, promotes healthy, proper blood clotting. Due to its better bile binding potential, steamed collard greens may actually be better at lowering our cholesterol than steamed kale and broccoli. These little-tree-look-alikes are jam packed with tons of vitamins and minerals, especially vitamin A, K, and C! Lucky for us, vitamin A and K work together to increase vitamin D absorption, which may help boost your mood, improve cognitive function, and promote bone and muscle health. Plus, vitamin C provides great immune support, anti-inflammatory benefits, and anti-cancer properties. So hop on the broccoli train with us, next stop - great health! helps with vitamin D absorption, supports cardiovascular health, boosts the immune system, provides anti-aging skin benefits and eye health, helps bind bile acids and lower cholesterol levels. The fiber in broccoli helps bind bile acids in our digestive tract and thus helps lower cholesterol (even more so when steamed).